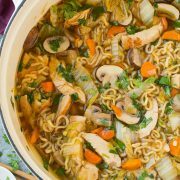 This Chicken Ramen so easy to throw and it’s packed with flavor! 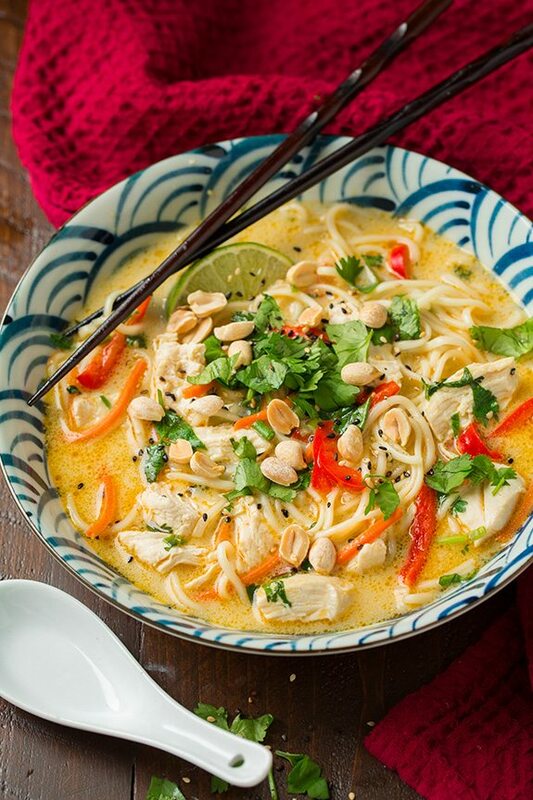 It’s a comforting Thai flavored soup that’s packed with veggies, tender pieces of chicken and a creamy coconut broth. Then it’s finished with peanuts and sesame seeds for a delicious crunch for contrast. The beauty of ramen is that it’s so easy to create your own custom ramen. 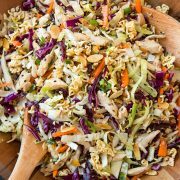 All you need to do is pick a protein like chicken, shrimp, pork, eggs or tofu and pile in the veggies, like, cabbage, carrots, bok choy, mushrooms, corn, spinach, cabbage etc. You can even add in additional flavorings like I’ve done here to give it a thai kick. 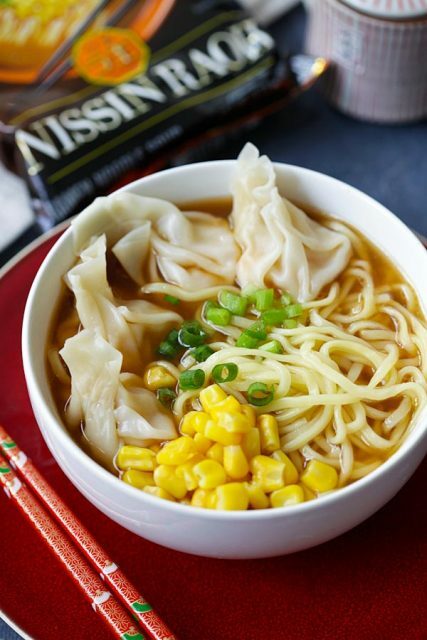 This version is a great place for you to get started on all that you can create with a package of ramen! 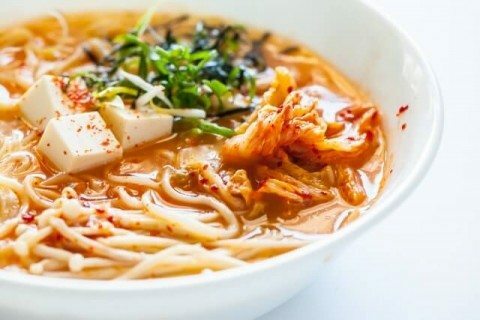 You’ll love this ramen! It reminds me a bit of pad thai but in ramen soup form. Plus it’s so easy to make! –Single pack rom Amazon (single packs can only be ordered by Amazon Prime subscribers). Tonkotsu is a style of ramen from Kyushu (southern Japan) and is the most popular flavor of ramen in both Japan and the US. RAOH Umami Tonkotsu features many layers of flavors, including onion, garlic and ginger making the soup rich and robust. 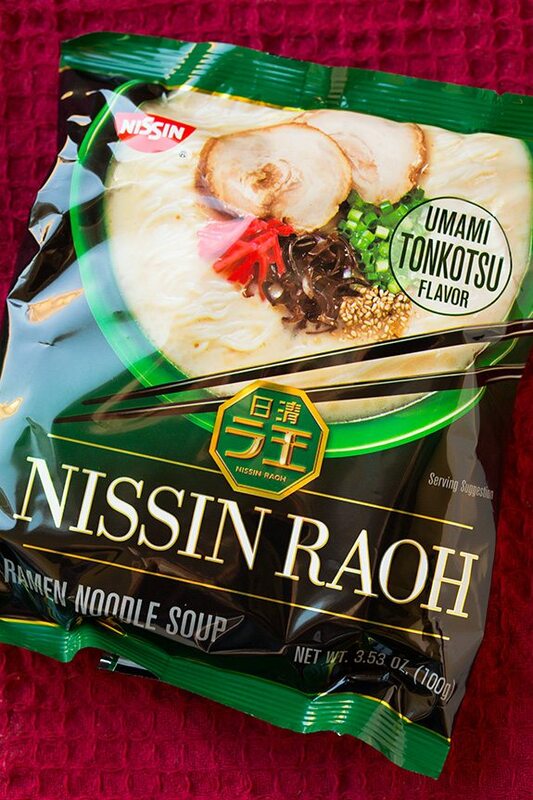 I also love how the Nissin RAOH Ramen are so versatile. Yes, of course you can just eat them straight up as they are, not changing a thing and you’ll still get a delicious bowl of ramen, but if you want to make it more of a meal you can add a protein and veggie to complete it. And the best part? 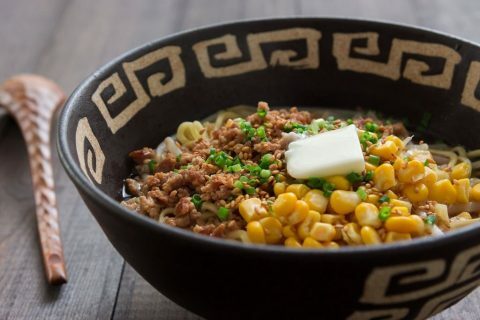 Unlike existing instant noodle products which are deep fried, RAOH’s ramen noodles are not fried, so they contain no trans fats, no cholesterol and very little saturated fat. 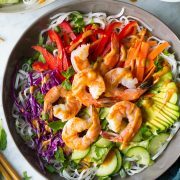 More Asian Recipes to Try! 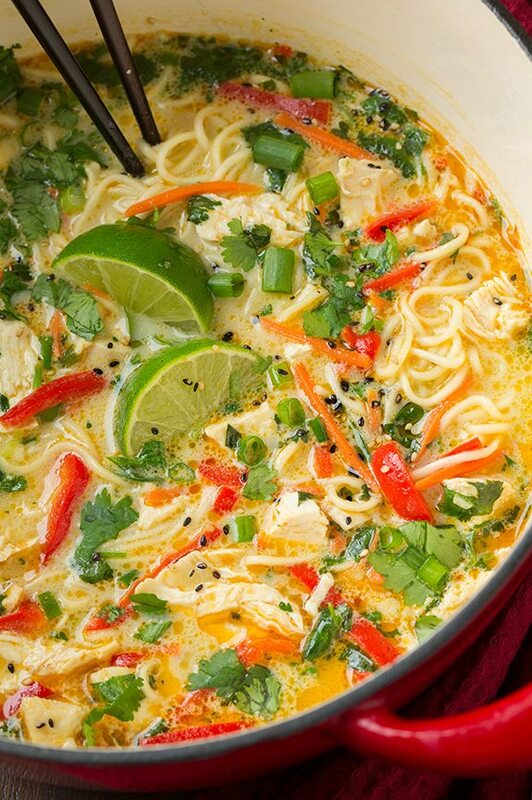 This Chicken Ramen so easy to throw and it's packed with flavor! 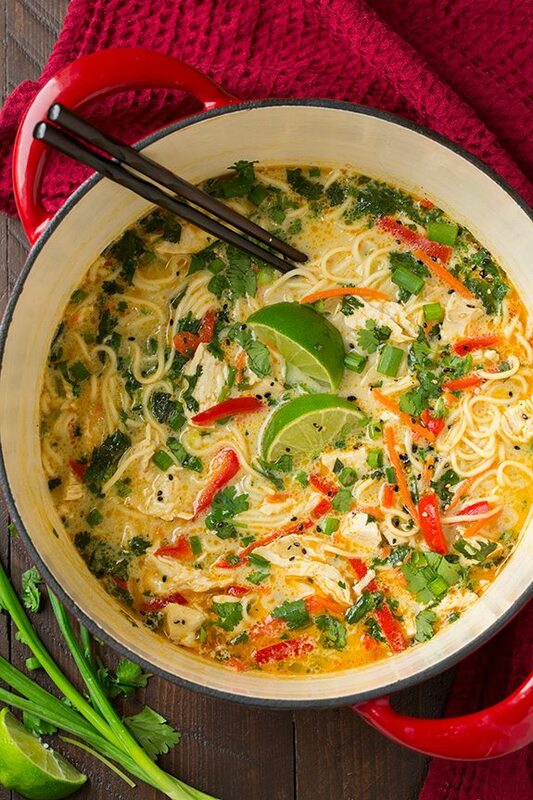 It's a comforting Thai flavored soup that's packed with veggies, tender pieces of chicken and a creamy coconut broth. Then it's finished with peanuts and sesame seeds for a delicious crunch for contrast. Heat oil in a large pot over medium-high heat. Add bell pepper, carrots and 3 of the green onions, saute 1 minute. Add Thai green curry paste and saute 1 minute longer. Stir in water and coconut milk and fish sauce and bring mixture to a boil. Add in ramen, cover pot and boil 4 minutes, stirring once halfway through. Meanwhile add seasoning packets from ramen to a bowl. Ladle out 1 cup of the water mixture from soup and stir into seasonings in bowl then return to pot. Stir in shredded chicken lime juice and 1/4 cup of the cilantro. Divide among 4 bowls then top with more cilantro, remaining green onion, peanuts and sesame seeds. Serve immediately.